Scientific Name: Theobroma cacao L.
Seeds: fat, theobromine, small amounts of caffeine, polyphenols. Cocoa grows on trees. 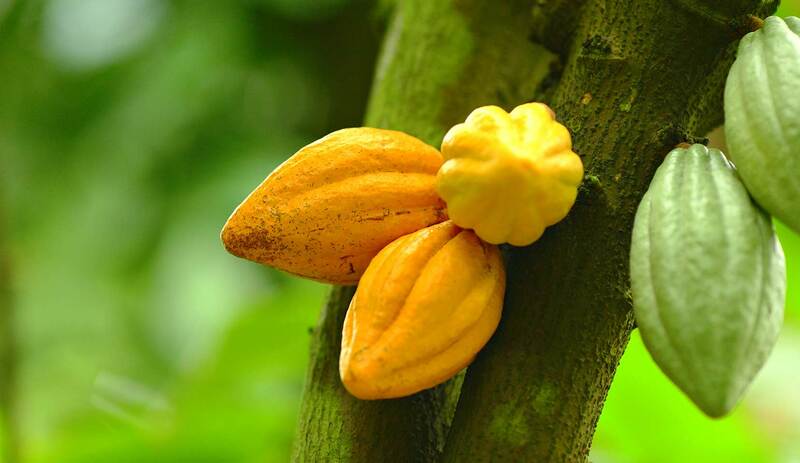 As tropical trees go, the natural supplier of our beloved chocolate is quite small. It grows to a height of five to ten metres in the shade of taller tropical trees and its trunk can reach a diameter of about 25 centimetres. Its dark-green shiny leaves can grow to 30 centimetres long and 10 to 15 centimetres across, and form a dense treetop. The small white or red blossoms do not grow at the tips of the boughs, as with other trees, but sprout directly from the trunk – a phenomenon known to botanists as cauliflory. Ants and midges pollinate the blossoms. The cocoa fruit, which can reach 25 centimetres in length and is pointed at the farther end, is attached directly to the trunk of the tree. Embedded in the soft, sweetish pulp of the fruit are numerous almond-shaped seeds – the cocoa beans. The cocoa beans, which are rich in fat, yield cocoa powder as well as the so-called cocoa butter obtained by pressing and filtering. This cocoa butter is used not only in the chocolate industry, but also as a base mass for suppositories and in skin care. It is readily absorbed and makes the skin supple and smooth. The Swedish botanist and taxonomist Carl von Linné (1707-1778) gave cacao its scientific name Theobroma, which translates as ‘food of the gods’, from the Greek theos = god and broma = food. The word cacao itself comes from the Olmec language, in which the chocolate tree is called kakawa. The Olmecs lived around the Gulf of Mexico from 1500 BC. The legacies of their culture include the first numeric system of Central America and monumental depictions of their gods in stone, as well as a method of preparing maize which made it more nourishing and easier to process. In 1519 the Spanish conquistador Hernán Cortés (1485-1547) was introduced by Montezuma to a bitter beverage made from cocoa beans, which the Aztecs called xocóatl. This is where the word chocolate comes from. strongly when stirred. Chocolate was reserved for the upper strata of society. Cocoa beans were also a high-value currency. Cacao played an important role in the rites of the Aztecs, as numerous pictures show. They regarded chocolate as a symbol of blood. The Spanish conquerors in Central America started sweetening the cacao drink because they disliked its bitter taste. It was they who introduced chocolate to Spain, where even today a traditional breakfast of churros (fried choux pastries) is accompanied by a cup of thick, hot chocolate. From Spain, chocolate set out on its sweet conquest of the rest of Europe, in the course of which it became a bone of contention for the Catholic Church. Was chocolate a food or a beverage? The answer would decide whether chocolate became taboo during Lent. A succession of popes confronted this question and decided each time that chocolate is a beverage and thus permitted during Lent. typical taste. After fermenting, the beans are dried for up to two weeks in the sun. They are now fit for storage. To make cocoa powder and cocoa butter the treated beans are roasted and then shelled. The shells are used in infusions, as fertiliser or in poultry feed. The cocoa mass, or 'cocoa liquor', is subsequently refined in several steps during which the chocolate flavour is improved. Grinding and heating produces the cocoa butter, which is separated from the cocoa powder by pressing. Cocoa contains polyphenols – these are pigments, flavour components and tannins with which the plant defends itself against predators or attracts pollinating insects. Polyphenols are thought to have a health-promoting action on the human organism. They are supposed to have anti-inflammatory properties, to protect body cells against free radicals and to reduce fatty deposits in the blood vessels. Proof at last, it seems, that eating chocolate really is healthy. Dr.Hauschka Eye Balm, Clarifying Day Oil, Regenerating Eye Cream, Lip Balm and Lavender Sandalwood Calming Body Cream all contain cocoa butter. It is sourced from fair trade suppliers in Bolivia. In 1977 five Bolivian village communities formed a cooperative to take the processing and marketing of the cocoa they were cultivating into their own hands. Today, more than 30 village communities belong to the cooperative, which has had the entire cultivation certified as organic.